Our 12th Vintage features two of our favourite English hop varieties, Northdown and Challenger. These, combined with floor malted Maris Otter malt, produce a rich fruit aroma laced with dark orange hop notes. A full luxurious mouthfeel is finished off with a satisfying alcohol warmth. UPDATED: APR 12, 2019 Bottle at lcbf. Medium tan blend. Scent is big licorice and fruit pulp. Taste is big melon raspberry flavors on old ale. Finish is clean and dry ale. Very great. UPDATED: DEC 28, 2018 500ml bottle, No. 59562. Pours dark brown amber with a reddish tinge, a beige foamy head leaving alittle lacing and aroma of molasses, toffee, dried fruits. Taste is sweet malty, molasses, brown sugar, caramel with raisins, christmas cake, leathery, dried fruity, chocolate hints, earthy, boozy and some orangey hop bitterness. Medium bodied, soft carbonation, dry earthy boozy bitter finish. Nicely drinkable. 50cl bottle pours with a clear mahogany colored body that supports a nice looking near white head of foam. The aroma offers up booze infused plums, figs and some dates and cherries as well. Behind the fruitiness is a faint molasses sort of maltiness. The taste delivers smooth blueberry, plum, dates and fig like sweet fruity esters. It thins out to midway as the jamminess recedes a bit to reveal a bit of molasses and chocolate malts. Really nice. I think this vintage is peaking right here at ten years. 3Feb2018 Sweet grape must, sweet redcurrant, caramel, sweet grain and cereal malts, dark molasses. Slightly hazy brown, small, creamy, off-white head. Medium sweet. More caramel, sweet grain and bread malts, dark molasses, dark, candied fruits, prunes, soft carbonation, medium bodied. Very nice, aged very well. Bottle shared at Leighton's - thanks to mr_fr0g. Bottle shared at Leighton's place 03/02/2018. A clear amber copper coloured pour with a halo of beige head. Aroma is dusty, toffee, amber malts, minty, mellow age, strawberry shortcake. Flavour is composed of semi sweet, toffee, nutty malts, cakey, dried fruit, cake, riasin. Palate si medium sweet, rounded, moderate mellow carbonation, Dusty. I like it. Held up well with the age. *Bottle from my cellar. The beer starts mild and fruity deep. Hints of wood and tobacco, intense deep and malty caramelly. Oxidated, round and malty deep intense with a light but deep dry finish. Great! Part of a vertical tasting of vintage years 2008 through 2015, drank in January 2017. 2008 (bottle #127432) was rounded out to a solid caramel, with that lovely oxidation that makes vintage beers what they are. 2009 (#105287) suggested some tobacco and a luscious nose. 2010 (#094046) help up better than the 2011 (#108000), with better caramel flavors and some fizz; the later year was just flat and old tasting. 2012 (#125741) was clearly brighter in the nose, though losing some of its body, while the 2013 (#109909) was showing some signs of oxidation. 2014 (#141264) was equally bright with 2015 (#134049), and both were worthy bottles that I could have enjoyed had I just been sitting with the whole bottles. Thanks for my friends for joining me as I shared these bottles. Been cellaring for a while, No. 71701. 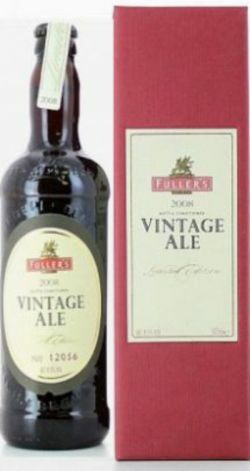 Pours a hazy amber colour with a beige creamy head, good retention and some creamy lace. Dark fruit aromas with caramel malts and some nutty notes. The taste has the figs, raisins, nuts with the toffee and the hops appear in the finish. Mild grassiness giving a little bitterness. What lingers is quite nice.